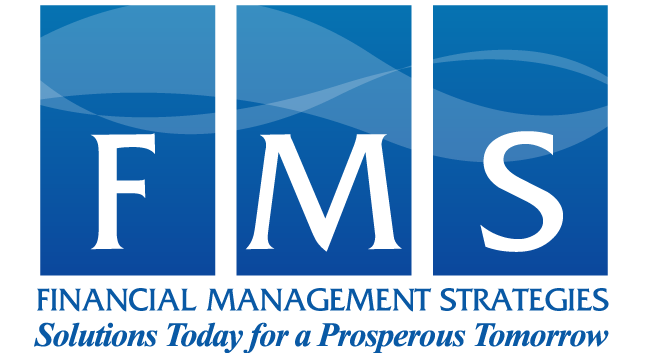 A good investment advisor can make financial decision making a hassle-free experience-and help you develop the peace-of-mind to sleep well at night regardless of what happened in the stock market during the day. Since investment advice comes in many flavors, the challenge is to find the one that's the right fit for you. Do you need a broker, a financial planner or an investment advisor? While these titles are often used interchangeably, the services provided by each of these professionals are often quite different. Generally speaking, brokers help investors buy and sell securities. Financial planners help investors prepare strategies for specific goals, such as retirement, and investment advisors provide advice for a fee. Of course, it's a bit more complicated than it first appears. Many of the investment professionals who you might think of as brokers are actually financial planners, just as some planners are actually brokers in disguise. To further complicate matters, most investment advisors are also financial planners, but only some financial planners are investment advisors. Investment advisors, of course, are available in numerous makes and models-some provide advice on just a single topic, such as tax-aware investing, while others offer complete financial planning services. Thus you can see the confusion that led to the Department of Labor's (DOL) reasons for getting off the sidelines and trying to take some action. Forget the titles and their definitions for a minute and think about what it is that you want from a financial services professional. To find someone who can help guide your investment decisions, begin the search with a strict focus on your needs. Are you seeking advice about a single topic such as buying or selling a security? Are you planning your estate, planning for retirement or purchasing insurance? Are you in a high tax bracket and looking to minimize the impact of taxes on your portfolio? Do you need guidance in creating a financial plan that encompasses all of these issues and more? Once you have a good idea of the types of services you need, you will be much better prepared to find an advisor who offers those services. If you're not exactly sure what you need, find an advisor who offers a full range of services and let the advisor help you review your situation. Once you've found an investment professional that can meet your needs, be sure to ask the following questions before you invest: What are your qualifications? While there are no uniform credentials for financial services professionals, experience counts. In addition to experience, professional designations are often a good sign that the advisor takes his or her career seriously. Have you ever been disciplined by any government regulator for unethical or improper conduct? Although disciplinary action doesn't necessarily mean that this advisor will steer you wrong, there are just too many honest advisors out there to risk your money by taking unnecessary chances. Ask to see a copy of the advisor's "Form ADV" before you invest. The ADV will show you whether or not the advisor has been disciplined. Who do you work for? An increasing number of investors are making the decision to invest with independent advisors-that is, advisors who do not work for a big company, but instead founded their own small businesses. Independent professionals are not constrained by the need to support corporate business decisions, so they often have access to a much broader array of investment options than can be found at a big brokerage firm. Furthermore, because independent shops don't have the name recognition and marketing muscle of a national brokerage, odds are that they have to provide good service if they want to develop a solid reputation in the community and stay in business for any length of time. How do you get paid? For investment professionals, compensation can come in many forms. Common compensation methods include: Fee: Fee-based advisors either charge a percentage based on the value of the assets they manage for you, an hourly consulting fee or a fixed fee. Commission: Commission-based advisors earn a commission on securities they sell. Fee and Commission: Fee and commission-based advisors receive a combination of fees and commission for their services. Before you sign any papers, ask your advisor how he or she is compensated and how that method of compensation benefits investors. In fairness to the DOL and its rule, retirement plan participants could not ask any of these questions of their retirement plan service provider and most administrators and/or trustees were not effectively obtaining the best answers for participants. 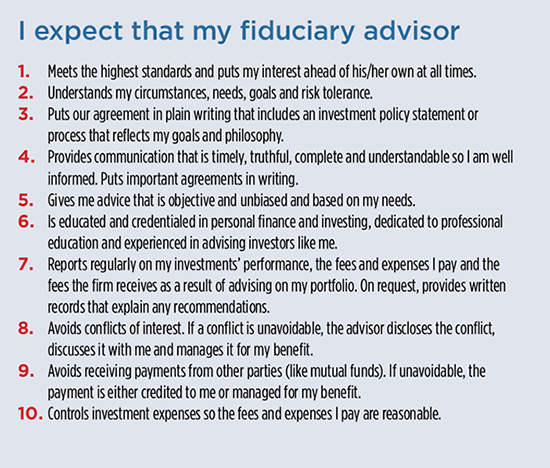 For years the word fiduciary has had almost the same number of interpretations, as there were titles or designations for financial advisors. In May 2016, the DOL has introduced a fiduciary rule to try and clarify how a financial professional should act as a fiduciary for retirement plan clients. Here is the 10 item “Investor Bill of Rights,” from the campaign that I would endorse as great ideas for both client and advisor. Selecting a good advisor isn't difficult; it just requires patience and thoughtfulness. The right financial advisor for you will help you make investment decisions at the cost, risk, return and timeline that you understand to best meet your needs. So before you rush out and make an investment in the "hot idea of the moment", take the time to choose your advisor carefully.